This is a start of a longer series on dehyrating fruits and vegetables. This will give you a preview of how they look and how to process them. Some things lend better to drying if they've been frozen first. Part of this is the pre-processing that goes into the vegetables before freezing and sometimes the affect of the frozen water crystals do to the vegetable's cell structure (mainly breaking their cell walls releasing extra water from the item). Many recommend starting with a store bough frozen green beans and drying from there. 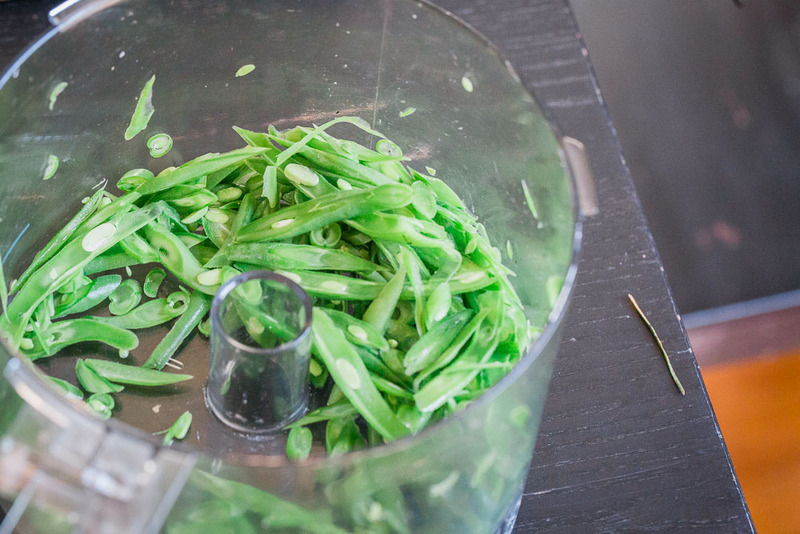 If you're making a dried meal but if you're in the prime season for that vegetable like these green beans are, this is how you would get it ready for your trip. First you have to remove the tough ends of the beans as they don't rehydrate well and are just not pleasant to eat. It can be tedious but worth it in on the end. 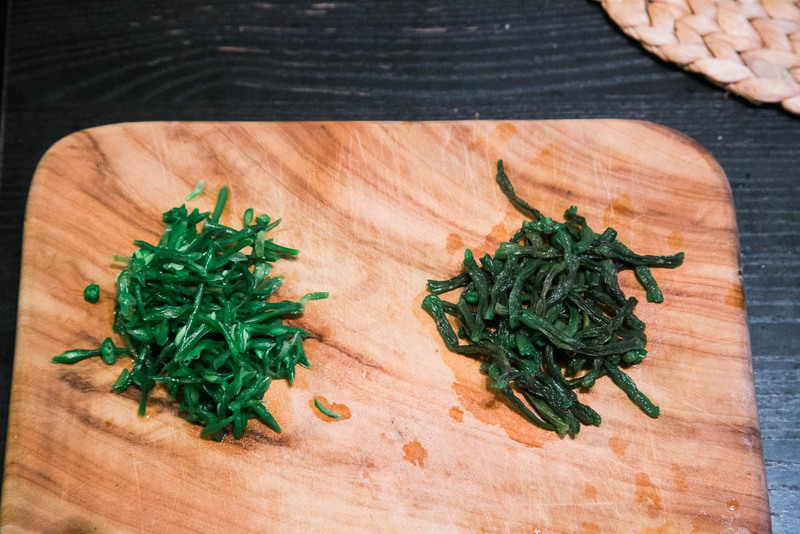 There are a couple of cuts of green beans that come into play for recipes. Whole beans and frenched-cut green beans are the most common. Whole beans are simple. Hand frenching a whole batch of fresh beans would be slow and kind of awful. 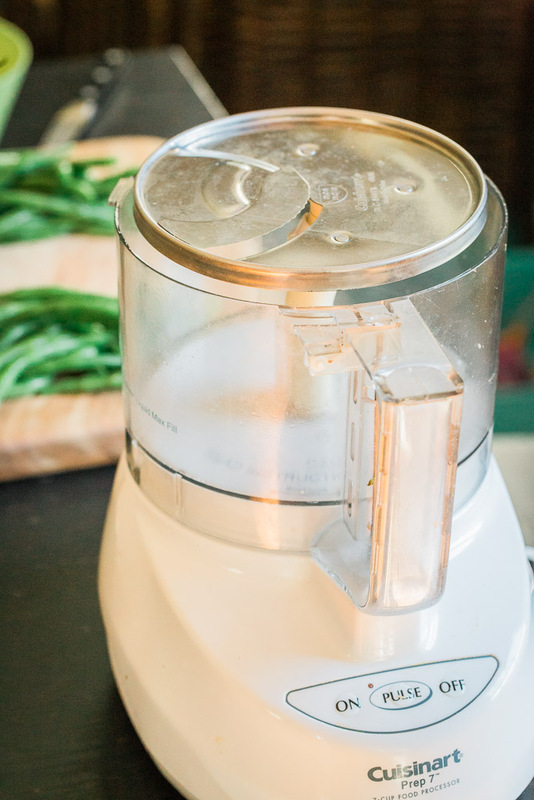 The food processor to the rescue. Just put the slicer blade on, lay the beans horizontally to the blade and cut away. Several cups of beans will be cut in seconds. Maybe not fine restaurant quality but definitely camping grade. I also like french-cut beans better because they dry faster and re-hydrate quicker too. Next, you need to steam blanch the beans no matter which way you cut the beans. This is preserve the color and start the break down/cooking process of the beans. After 3 minutes of steaming, dunk the beans in an ice bath to cool them down and stop the cooking process. Or you can just rinse them in cold water to cool them a bit of you're short on ice. If you started with frozen beans, you don't have to do this step. 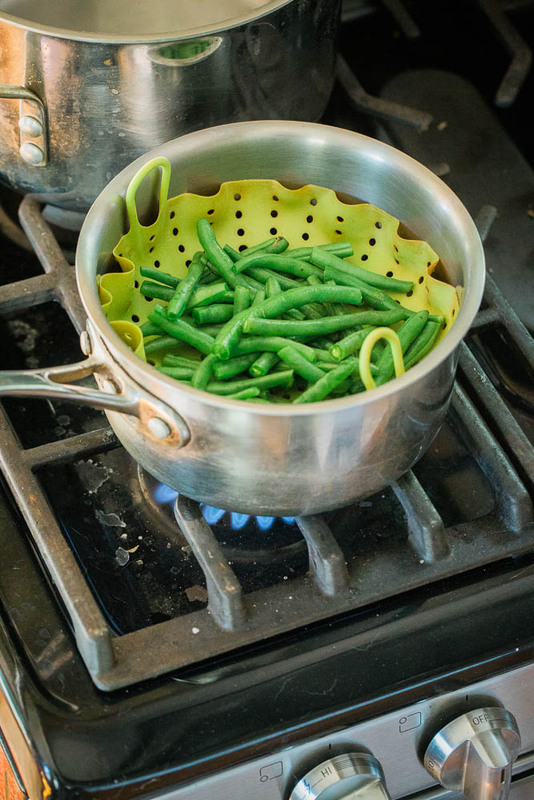 Arrange the beans on a dehydrater tray with a solid liner tray if you're doing frenched-cut beans. If you use the mesh liner, they tend to get struck in it as the shrivel. I learned by experience. Be sure to give some breathing room. Don't over crowd them or it will take a long time to dry. 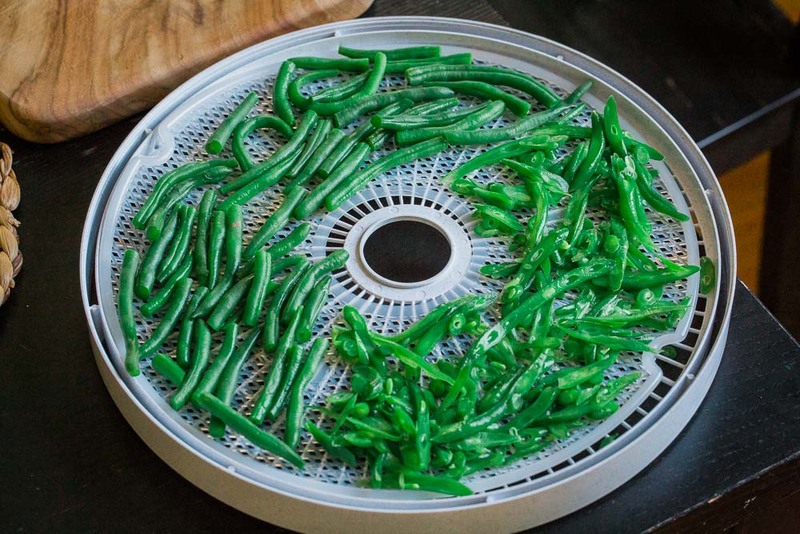 Turn on your food dehydrator to 135F and dry for 4-6 hours for frenched-cut beans or 6-8hours for the whole beans. Be sure to have a dehydrator that has a heat regulator and a good fan. I use the Nesco Snackmaster Pro FD-75A. It was around $70 and pays for itself in one 3 day trip. Quite a difference post drying. The beans should be hard and shriveled and be about 1/4 the volume. Make sure the beans are completely cooled before placing them in their final location. This allows them to release all of their remaining moisture. If you live in a place with higher humidity, the beans could absorb more moisture while cooling. You can place them into their final bag while warm and let them distribute any remaining water amongst the bag to avoid this. 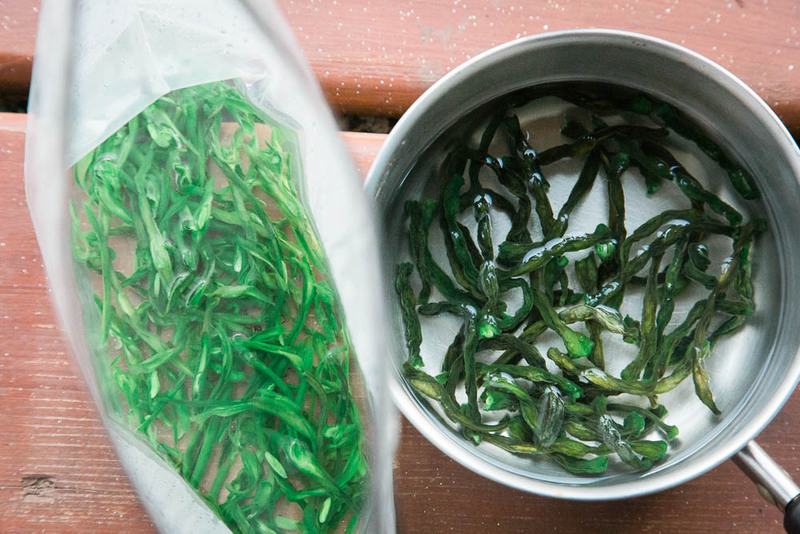 To re-hydrate for a vegetable only side dish, combine the dried beans with enough boiling water cover and cover the pot or seal the LokSak bag. The frenched-cut beans should take ~15 minutes & the whole beans around ~25 minutes. This is also a good time to add some flavor. I add homemade bouillon powder before boiling further. A knob of butter is always a nice touch for some needed fat. Any extra liquid could be used in a soup after it's been drained off through a piece of clean mesh/bridal veil material. One the left is the frenched-cut beans and the whole beans are on the right. The frenched-cut beans are closer to their pre-dried state. The whole beans are on the chewy side. Green Bean Hot Dish is one of my favorites to make with these.